The final did not live up to expectation. It only came to live late when Gambrinus attempted to reduce a 25-point deficit to 8 points before conceding at the end (75-60). Lauren Jackson was hot in the first half of the match where she scored 14 of her game high 18 points. She also came up with a total of 12 rebounds and 4 assists in her match winning performance. Sue Bird and Diana Taurasi finished with 14 points each. Tina Thompson added 12 points as the Spartak WNBA contingent dominated the final. It took five minutes for the game to get going. It was Russian international Marina Karpunina’s corner trey to spark a fast flourish for Spartak Moscow. Then Sue Bird hit a jumper from top of the key, quickly followed by a three-pointer by Lauren Jackson (12-2). Gambrinus’ head coach, Jan Bobrovsky, called for an immediate time-out. With his side only hitting 1-of-8 from the field at this point, he calmed his players down. Afterwards the team was finally able to find their mark with a Hana Machova trey (14-7). This attack only fired up Spartak Moscow. With Jackson, Taurasi and Thompson hitting their shots they took a 10-point advantage into the second period (24-14). This quarter was a technical affair with very few highlights. Lauren Jackson continued her festival to lead all scoring with 14 points as Spartak went into the interval with an increased advantage (43-27). Spartak Moscow continued to dominate the proceeding. They passed the 20-point margin (58-33). The expected blow-out did not happen as the hosts started to play good basketball. So Spartak went into the final period with a reduced lead (60-42). Gamrbrinus continued from were they left off in the third quarter. Even the temporary expulsion of their mascot did not stop them as they cut down their deficit to 8 points (63-55). Thompson’s return to the court for Spartak could not have happened at a better moment. Her excellent defensive moves made it hard for the hosts to score. The score did not evolve as both sides missed their shots and intensity increased. Jackson finally ended the stalemate from the free-throw line. Up stepped Zuzanna Zirkova with a trey. But then she was called for a foul on Sue Bird who made her free-throws. Tina Thompson’s solid defence helped Spartak Moscow to survive the storm and for them to win (75-60). 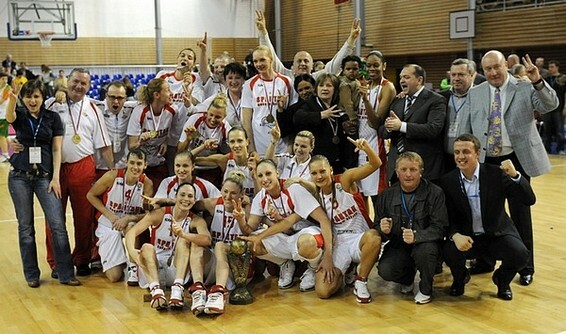 The EuroLeague Women third place match went to Ekaterinburg (70-69). In a closely fought match Caroline Aubert made the difference with crucial plays in the last 14 seconds. Her first action was to make a couple of free-throws to bring Ekaterinburg to within a single point (67-68). Belinda Snell from Bourges was sent to the free-throw line and managed to make 1-of-2. The Russians had less than five seconds to find a solution. When Deanna Nolan got a pass to Aubert, well behind the NBA three point line, the sentence was an immediate three-pointer exactly on the buzzer. The game was over, Ekaterinburg got a bronze medal. For the second season in a row Bourges left the final four empty handed.